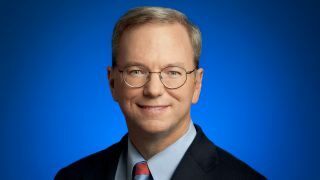 Google's ex-CEO Eric Schmidt has described the political situation between Apple and Google as being less like a gun-fight and more like a political balancing act. Describing relations between the two tech behemoths, Schmidt understated the situation by saying, "It's always been on and off. "Obviously we would have preferred them to use our maps. They threw YouTube off the home screen. I'm not quite sure why they did that." We might have an idea, Schmidtster – something to do with Apple wanting to own and control everything ever, perhaps. He went on to describe the two companies as being in a cold war, of sorts. "The adult way to run a business is to run it more like a country. They have disputes, yet they've actually been able to have huge trade with each other. They're not sending bombs at each other." "I think both Tim and Larry, the sort of successors to Steve and me if you will, have an understanding of this state model. When they and their teams meet, they have just a long list of things to talk about." We're sure. Other Schmidt-bits include his view of Google, Apple, Amazon and Facebook as the big four tech contenders, and identification of the losers in the patent wars as the potential future Androids and Googles. Although the patent fights between Apple and various Android-friendly device makers have hit headlines consistently over the past year, Schmidt says that none of the big companies are really losing out. "Google is doing fine. Apple is doing fine. Let me tell you the loser here," he warned. "There's a young Andy Rubin trying to form a new version of Danger [the smartphone company Mr. Rubin co-founded before Android]. How is he or she going to be able to get the patent coverage necessary to offer version one of their product? That's the real consequence of this."